Today, the City of St. John’s released the details of Budget 2016-18, its second three-year plan. “Revenues and expenditures are balanced at $302.2 million for 2016, a 4.4 percent increase over last year,” said Councillor Jonathan Galgay, Chair of the Finance Committee. “With a growing City and increased demands on operations and infrastructure we are now doing more with less. Cost increases to the City are a result of several factors including collective agreement salary increases, debt charges, new services and investments in paratransit. 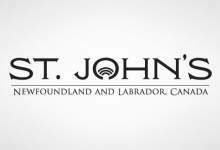 The City of St. John’s is committed to providing the best municipal services to the public in the most cost effective manner. Over the next three years expenditures are expected to increase by $12.8 million in 2016; $20.1 million in 2017; and $26.9 million in 2018. Water taxes will increase marginally over the three-year period from the current rate of $615 to $630 in 2016 (2.4 percent increase); $670 in 2017 (6.3 percent increase); and $675 in 2018 (0.7 percent increase). * In 2016, the City will eliminate the mil rate reduction for properties not connected to City water and sewer, this equates to an annual savings of $500,000. In 2018, the City will eliminate the vacancy allowance currently offered to commercial property owners; savings are projected to be $5.5 million. Other savings include internal staff reductions through retirement and reallocation of resources by $8.4 million over three years through; a reduction in grants and art procurement; and a delay in implementing the automated garbage program. With this is mind, the City will divest itself of a number of services and operations including private water and sewer lateral repairs that are currently provided for a nominal fee to the public, the annual operating grant to Aquarena, and the capital allocation provided to the Grand Concourse Authority. The City will also return the operation of the Shea Heights and Buckmasters Circle Community Centres back to the neighbourhoods they serve. To improve neighbourhoods and services that are available to residents the City is moving forward on major projects including Victoria Park revitalization in spring 2016; Kenmount Terrace Community Park; Paul Reynold Community Centre; the new pool house for Bowring Park and a multi-purpose leisure space that will replace HGR Mews Community Centre. Budget planning has been ongoing since June when Council invited the general public and key stakeholders to contribute to the process through online and in-person engagement. Key focus areas for the public included neighbourhood planning and development, improved collaboration, communication and transportation, and accessibility. The public also asked Council and staff to consider the issues of our changing demographics and to seek innovative ways to achieve savings. Budget 2016-2018: Investing in Tomorrow is in line with the City’s Corporate Strategic Plan and supports the 10-Year Capital Plan: 2015 – 2024. PDF version of Budget is available here, including 3 year projections. See backgrounder for more information on residential property values. * An error in the media release issued Dec. 14 has come to our attention. Please note the following correction that was made to the release on Dec. 21, 2015. Please see eighth paragraph which stated: In 2016, the City will eliminate the mil rate reduction for properties not connected to City water and sewer, and in 2018, the City will eliminate the vacancy allowance currently offered to commercial property owners, this equates to an annual savings of $500,000. The revised paragraph is: In 2016, the City will eliminate the mil rate reduction for properties not connected to City water and sewer, this equates to an annual savings of $500,000. In 2018, the City will eliminate the vacancy allowance currently offered to commercial property owners; savings are projected to be $5.5 million.